The Linotron 202 phototypesetter uses digital typefaces that are stored as outline vectors. It remains one of the leading medium-speed phototypesetters until desktop publishing takes over in the late 80’s. Itek is another manufacturer of photo typesetting machines. 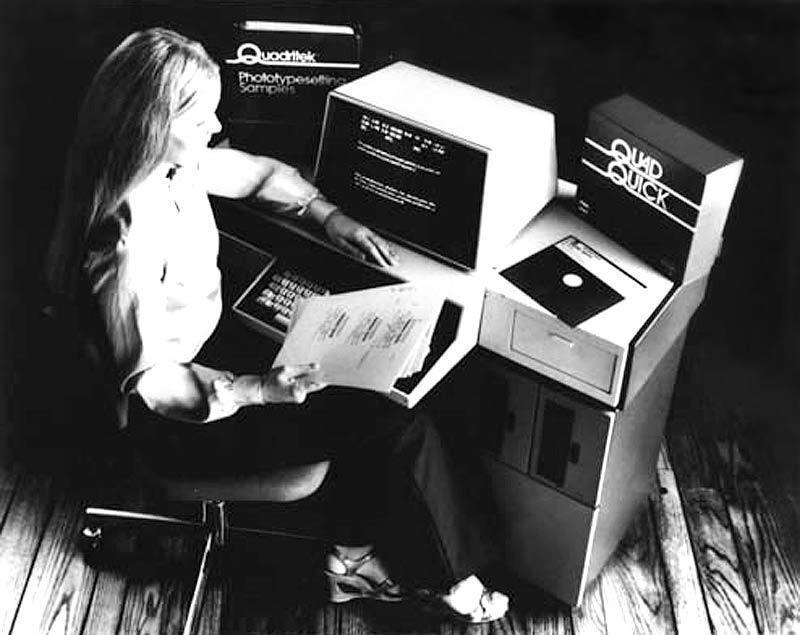 Below is an advertisement for the Itek Quadritek system, complete with 8-inch floppy drives. The Bobst Graphics Scrib is a portable computer for journalists. Using a separate acoustic coupler, reporters can send their articles to the newspaper over standard phone landlines. The integrated tape recorder can save up to 8000 characters on a microcassette. The white flap at the top holds a foldable mirror, used to show the typed text from the built-in 7 inch computer screen. 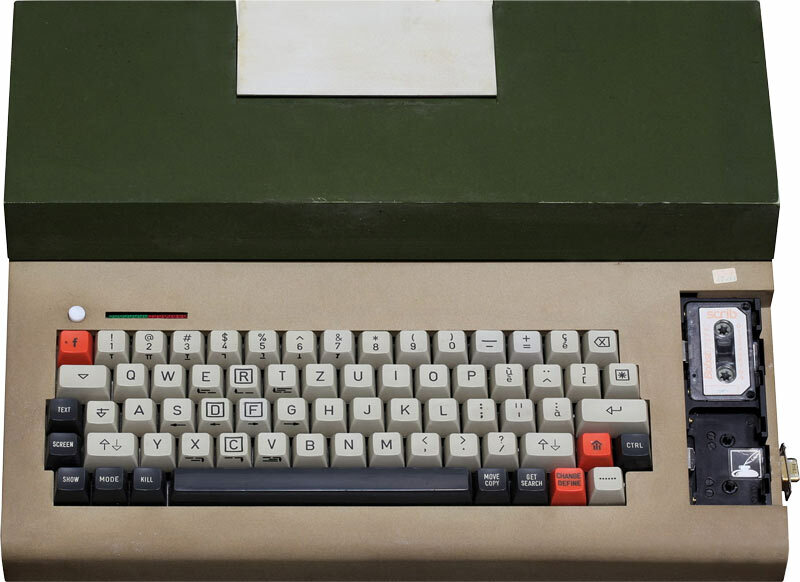 The computer weights 16 kilograms. Océ acquired the UK-based Ozalid Group Holdings, developer of the Ozalid reproduction process. With this acquisition, Océ becomes a world leader in printing products for the engineering market. 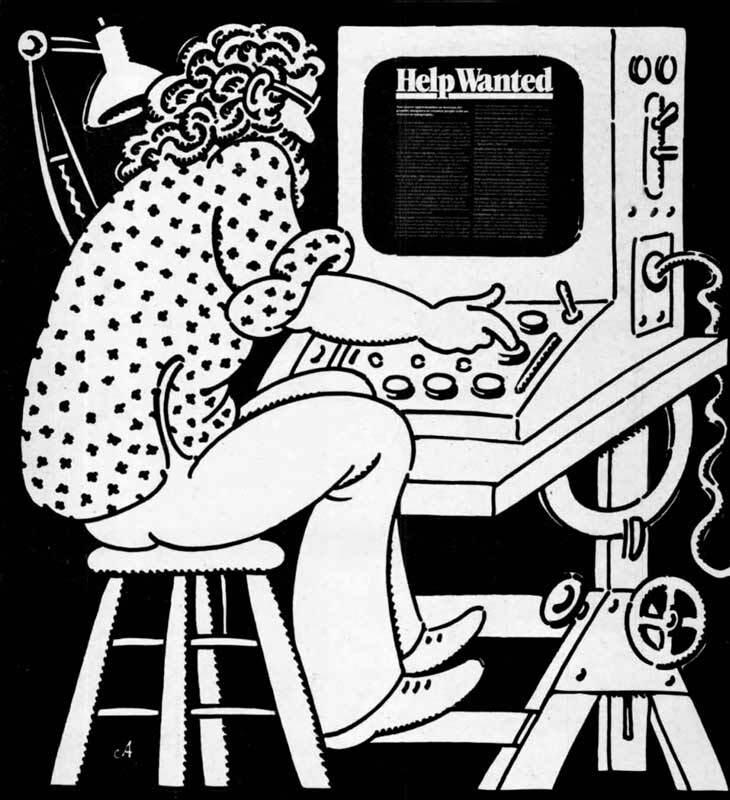 The cover of U&lc features an illustration by John Alcorn that fits with the times. It is truly the end of a decade when a Linotype is used for the last time to set the text of the New York Times. 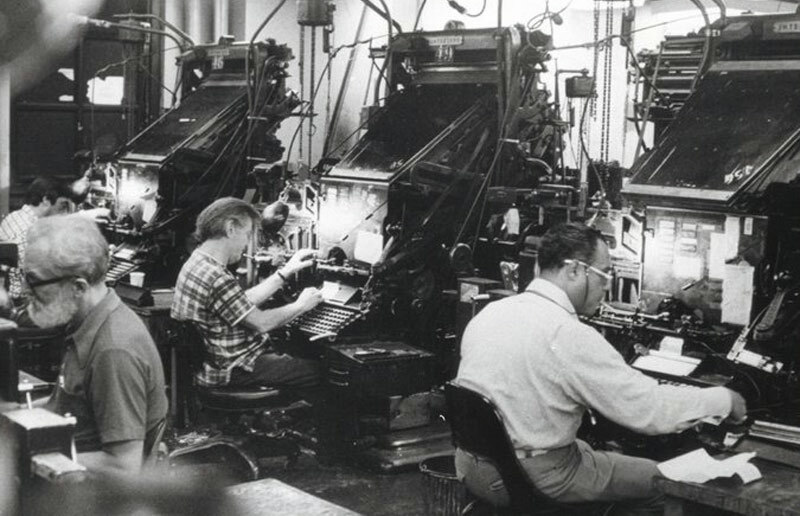 The picture below from the Carl Schlesinger Archive shows Linotype operators working on that July 2nd issue. AT&T commissions Matthew Carter to create a new typeface that allows them to fit substantially more characters per line in their phone books without loss of legibility. The end result is Bell Centennial, which the Mergenthaler Linotype Company also licenses for general public use. The oil tanker Amoco Cadiz runs aground on the coast of Brittany. Former Italian prime minister Aldo Moro is kidnapped and murdered. The musical Grease, starring John Travolta and Olivia Newton-John, is released. Louise Brown, the world’s first test tube baby is born in the United Kingdom. Pope John Paul I dies after only 33 days of papacy and is succeeded by Pope John Paul II.